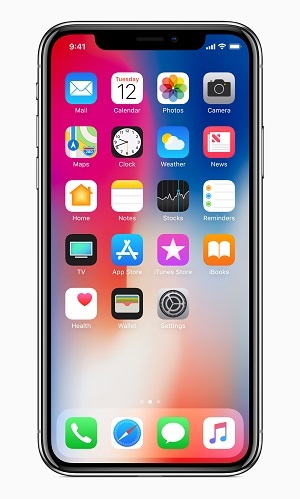 Apple debuts iPhone X with 5.8-inch all-screen OLED Super Retina display, Face ID, Animoji and Wireless charging. Apple today announced iPhone X, in a gorgeous all-glass design with a beautiful 5.8-inch Super Retina display, A11 Bionic chip, wireless charging and an improved rear camera with dual optical image stabilization. iPhone X delivers an innovative and secure new way for customers to unlock, authenticate and pay using Face ID, enabled by the new TrueDepth camera. The beautiful 5.8-inch Super Retina display is the first OLED panel that rises to the standards of iPhone, with stunning colors, true blacks, a million-to-one contrast ratio and wide color support with the best system-wide color management in a smartphone. The HDR display supports Dolby Vision and HDR10, which together make photo and video content look even more amazing. The addition of True Tone dynamically adjusts the white balance of the display to match the surrounding light for a more natural, paper-like viewing experience. Portrait mode with Portrait Lighting on both the front and rear cameras brings dramatic studio lighting effects to iPhone and allows customers to capture stunning portraits with a shallow depth-of-field effect in five different lighting styles. With iOS 11, iPhone X supports HEIF and HEVC for up to two times compression and storage for twice the photos and videos. A11 Bionic, the most powerful and smartest chip ever in a smartphone, features a six-core CPU design with two performance cores. A new, second-generation performance controller can harness all six cores simultaneously. A11 Bionic also integrates an Apple-designed GPU with a three-core design. The glass back design on iPhone X enable a world-class wireless charging solution. Wireless charging works with the established Qi ecosystem, including two new wireless charging mats from Belkin and mophie, available from apple.com and Apple Stores. iPhone X will be available for pre-order beginning Friday, October 27 in more than 55 countries and territories, and in stores beginning Friday, November 3. + iPhone X will be available in silver and space gray in 64GB and 256GB models starting at $999 (US) from apple.com and Apple Stores and is also available through Apple Authorized Resellers and carriers (prices may vary). + Through Apple's iPhone Upgrade Program, customers in the US can get iPhone X, with the protection of AppleCare+, choose their carrier (no multiyear service contract required) and have the opportunity to upgrade to a new iPhone every year. The iPhone Upgrade Program is available for iPhone X at apple.com and Apple Stores in the US with monthly payments starting at $49.91. + Customers will be able to order iPhone X beginning Friday, October 27, with availability beginning Friday, November 3, in Andorra, Australia, Austria, Bahrain, Belgium, Bulgaria, Canada, China, Croatia, Cyprus, Czech Republic, Denmark, Estonia, Finland, France, Germany, Greece, Greenland, Guernsey, Hong Kong, Hungary, Iceland, India, Ireland, Isle of Man, Italy, Japan, Jersey, Kuwait, Latvia, Liechtenstein, Lithuania, Luxembourg, Malta, Mexico, Monaco, Netherlands, New Zealand, Norway, Poland, Portugal, Puerto Rico, Qatar, Romania, Russia, Saudi Arabia, Singapore, Slovakia, Slovenia, Spain, Sweden, Switzerland, Taiwan, UAE, the UK, the US and US Virgin Islands.